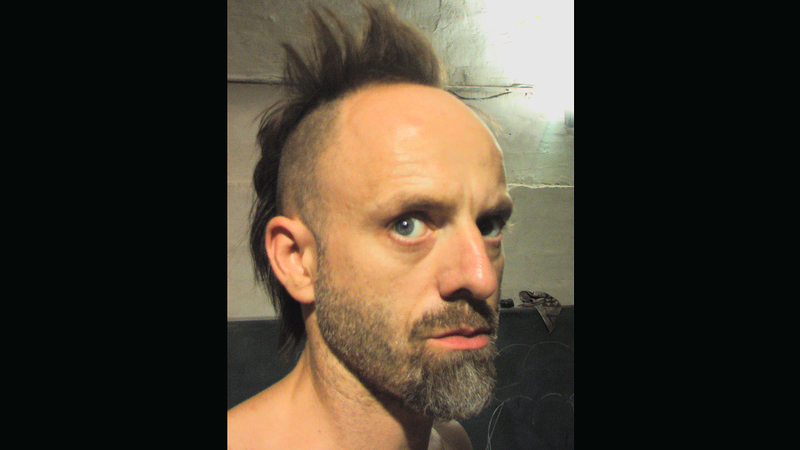 Tobias Johannes Ferdinand Husemann was born in 1970 in Stuttgart. 1982: Foundation of his first Marionette Theatre. 1985-1987: First public performances in the Bürgerhaus in Ruit. 1987-1990: Carpentry Apprenticeship at Binsch in Ruit. 1991-1993: Studies at the Kunstakademie in Stuttgart. 1993-1995: Interio Designs – Free Furniture design. On completion of his studies, Thomas founded the firm Interio Designs where he produced artifacts of wood and steel for customers including: Kurt Weidemann, Heidemarie von Wedel, Thomas D, Zadu Bar, Libero, Forum 3, THC, Vegi Voodoo King, Verleihnix Comics, Boots by Boots, Todschick, Brett, Firma Bonn, Herbertz, 551. Some of his works from this era can be seen in the Archiv. „Elvis’ New Clothes“ Street theatre with large-scale puppets at the International Puppet Theatre Festival in Jerusalem. 2002: First experiments with improved techniques for constructing movable puppets of unusual dimensions. 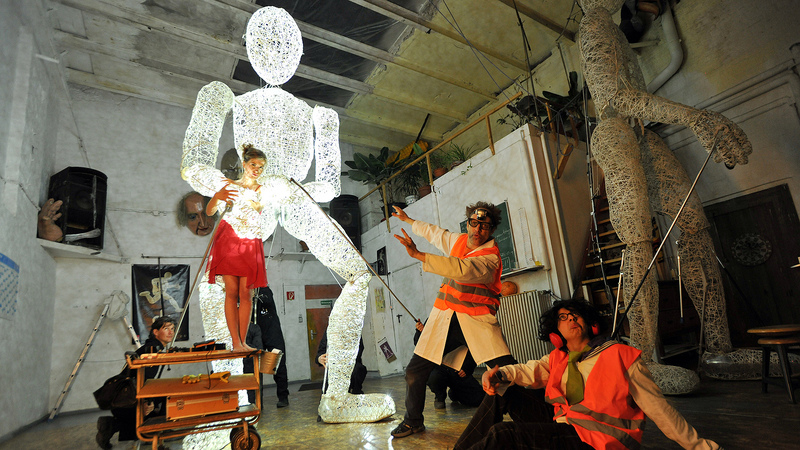 Creation of the prototype for a large-scale puppet in his own image. 2004-2005: Exhibitions of a „Giant Puppet Mobile“, „Tree of Life with Bimbi and Dundu“ at Potsdamer Platz in Berlin. 2005-2007: Move to Stuttgart in an Atelier in the Kulturbetrieb Wagenhallen. Construction of the 5 meter tall marionette Dundu and the development of a completely new method of animation. Recruiting a team of puppeteers, training and first performances with the Giant Puppet „Dundu“. Construction of large-scale masks and models for „Campact – Demokratie in Aktion“. 2008: Construction of Kohlosaurus for „Campact“. The Dinosaur in the form of a Coal-fuelled Power Station is to be seen on a tour of German towns promoting the „Klima Allianz“. A Climate Protection group of more than 100 organisations, the online network „Campact – Demokratie in Aktion“ and the „Deutschen Umwelthilfe“. 2010: Team building and increasing volume of performances with Dundu. Further Giant Portrait Mask constructions for Campact. 2011: Further development of Dundu and his puppeteer team. Construction of 2, 80cm. tall Dundus. Highlight of the year: Performance at Hamburg Airport’s 100 Year Jubilee. 2012: New development in the method of animation, „Dundu 2.8“. Dundu’s first major TV appearance in the „Helene Fischer Show“. Continued constuction of portrait masks for Campact. that this year he’s a permanent fixture in her show. Further highlight: Performance of 3 Dundus at the opening ceremony of the „Mediterranean Games“ in Mersin, Turkey. 2014: Research and development of new navigation and animation techniques. Highlight: Dundu in Dubai at the Horse Racing World Cup. 2015: Completion of „Bimbi“ whose development started in 2011. Unforgettable this year, Dundu’s performance in Las Vegas. 2016: First major TV appearance of Bimbi and Dundu in RTL’s Puppenstars Show in January.